Have you noticed discoloring on your ceiling from damaged or stained areas? Are there holes, dings or punctures in your walls you want fixed? Few home improvement tasks can make such a difference. Drywall repair can rid your walls or ceiling of any flaws or damage and leave your biggest investment looking like new again. When it comes to perfectly finished drywall, you've come to the right place! When you choose Palmer Pro for drywall repair, you will be guaranteed a seamless result. From start to finish, Palmer Pro will ensure your drywall repair project is done right the first time. 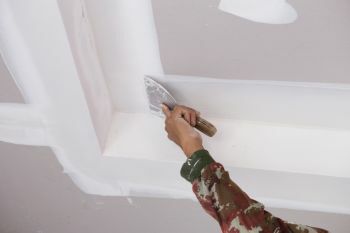 The drywall tape is placed over joints in the ceiling or walls that need repairing. We make sure the tape lays smoothly across the joint and remains flat over the drywall seams. After applying the joint compound and it has completely dried, we will sand away any imperfections in the surface. When the sanding is complete, we will apply a second coat of joint compound, again sanding the area to ensure a smooth finish. Once we are finished with the drywall repair process, you will never know there were any flaws in your ceiling or walls. Residents and business owners have counted on Palmer Pro for smooth and even finished drywall repair since 2015. For over 4 years, Palmer Pro has provided comprehensive drywall repair. From damaged drywall, wall and ceiling repairs, drywall repair for holes, dents and water leaks, drywall repair for cracked joints, damaged corners and sagging drywall, and much more, turn to Palmer Pro. Our punctuality, cleanliness and strive for customer satisfaction are unmatched among the competition. Call (832) 410-1868 for a free drywall repair quote today.